The kitchen is not just a spot for cooking and eating. It is, in fact, the heart of your home. It even acts as a room to place so many items — including storage furniture, refrigerator, microwave, cooktop, and others. With multiple objects being kept here, it becomes necessary to apply some thought into the arrangement and design of its various accessories. Therefore, today, we will take you through some important tips about one important component of the kitchen — its furniture. Whether you are renovating, redecorating, or simply updating your kitchen, check out these clever kitchen furniture ideas that shall transform this area into a striking, functional space. Kitchen drawers are quite a practical idea to utilize the vertical space in your cooking area. You can install a built-in drawer set as per the current layout or get a freestanding chest of drawers like in the image above. Utilize each compartment for storing similar utensils so that you can find them easily at a single glance. When you say kitchen furniture, the first name that comes to your mind is the cabinetry. They are available in an astounding range of variety — from plain maple wood to stainless steel cabinets. Moreover, you can get cabinets in three variants based on construction type — custom, semi-custom, or readymade. Available in a myriad of styles, designs, and colors, kitchen cabinets offer the maximum visual impact. Apart from this, they also need to be accessible, durable, functional, and resistant to frequent wear and tear. To get started with installing the perfect kitchen cabinets, check out the latest cabinet trends in the market. Have a look at your existing layout and consider the required functions. Then choose one that meets all the above requirements. 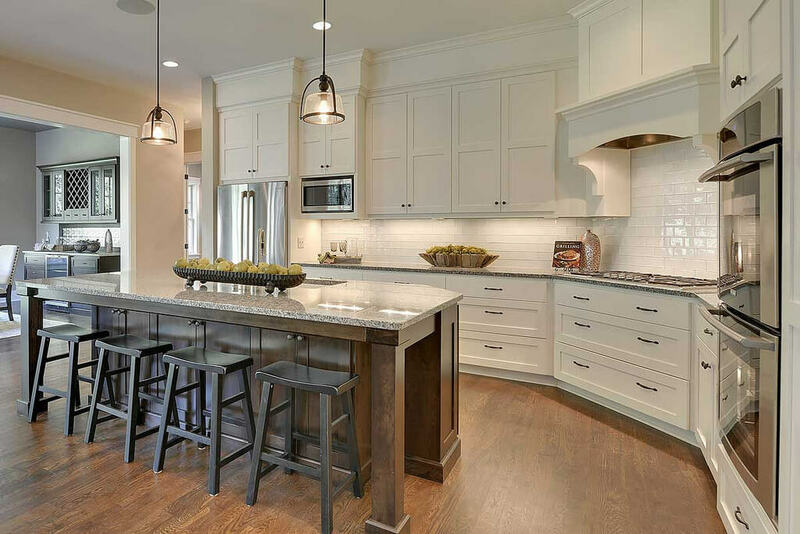 Kitchen furniture ideas cannot be complete without considering their favorite component — the kitchen island — which offers endless scope for decor and design tips. 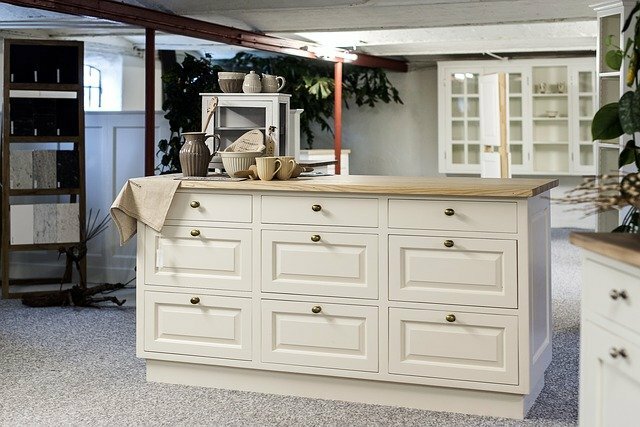 When you require more storage or counter space, placing a kitchen island shall serve both your functional and aesthetic needs. An enclosed kitchen almost always goes well with the popular island-in-the-center idea. You can then access the island from all sides. It will also provide enough room for people to walk around. However, if you have an open floor plan, you can consider a perimeter island. Check out our best ideas on kitchen islands with storage here. If you have long kitchen counters that can also serve as a meal and work table, why not consider adding a couple of bar stools? You can get them in any type of material such as wood and metal. They also come with cushions made from leather, suede or easy-to-clean, premium combinations of leather and plastic. Bar stools arrive in designs like rustic, modern, minimalist, Scandinavian, industrial, mid-century modern, and futuristic. You can pick a set that best matches your budget, existing layout, and purpose. Integrating the dining table into your kitchen is another of the smartest kitchen furniture ideas. Why so? This open-kitchen plan gives you ample scope to try out various fun and creative design combinations. For this layout, using matching colors in kitchen and dining furniture is perfect to render a cohesive look to the whole area. In order to achieve a traditional look, go for wooden sets and for a light, beachy look, bring in a round glass table. You can go for slide-in benches with the table that can be tucked in when not in use. This idea is perfect when you have a space crunch and need to maximize the square-feet utilization — especially in flats and small homes. One more tip for small kitchens is to get a 4-seater set that can be placed in any corner of the room. In fact, there are plenty of ideas. All you need is some creativity and know-how of what will go with your space. 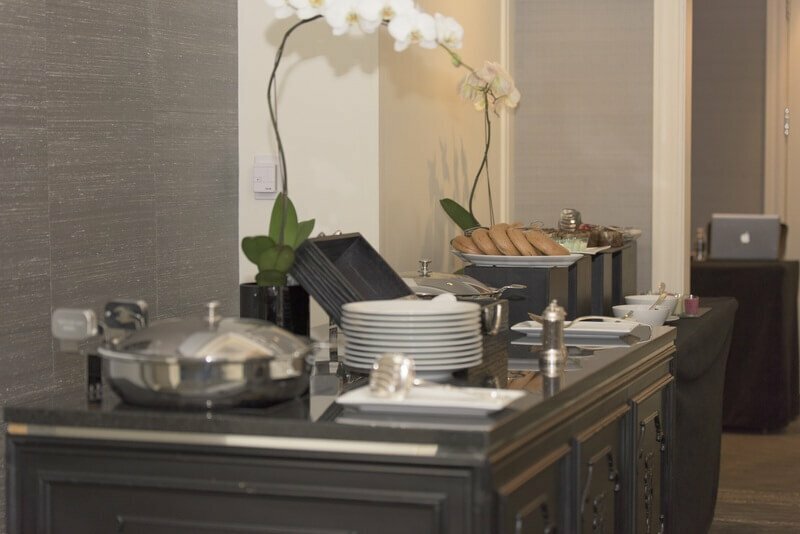 Keeping a kitchen cart in your cooking space adds a luxurious touch to your interiors. A charming, portable kitchen cart can be utilized for keeping all the necessary items during dinner time. Doing so will allow your guests or family to relish a sumptuous meal without having to get up repeatedly for fetching things. Kitchen carts feature a wide variety of styles, colors, and sizes — making them ideal to be used as barbecue accessories or for other entertainment purposes. Another of the clever kitchen furniture ideas is to install floating shelves. They will hang from your wall without brackets, nails, or additional visible supports. Stylish and functional, you may install them to increase space feels in a small kitchen. 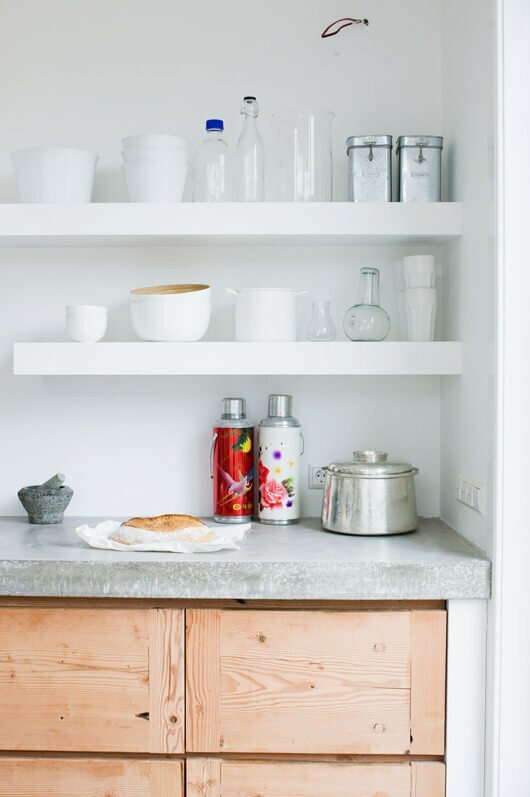 Fix floating shelves anywhere to enhance your kitchen design — in a narrow corner of the wall, in the middle of a backsplash, or on the side of a cabinet. Baker racks were originally made from metal or wrought iron. They were used by bakers for cooling items by placing the goods in the incorporated shelves. Nowadays, baker’s racks are available as ornamental kitchen furniture where you can display your wine collection or other decorative items. This is one of our favorite kitchen furniture ideas since it greatly amplifies the ambiance of your kitchen. Elegant and stunningly artistic, kitchen buffet tables transform medium and large kitchens into the focal point of the home. Buffet tables with granite tops act as a great space to work. Here, you can safely display your most valuable dinnerware or kitchen heirlooms. Wooden kitchen buffet tables — with their natural finesse and style — lend extra space and storage options to your kitchen. 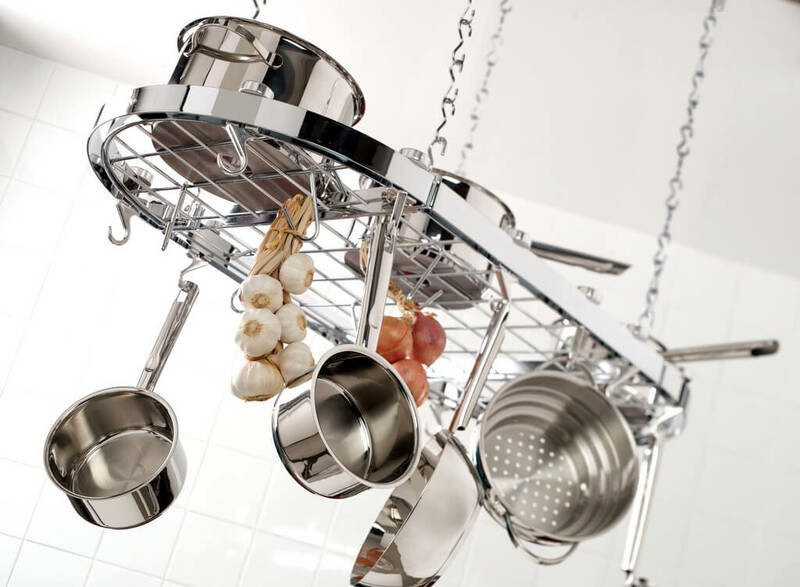 Pot racks may sound simple but they offer you the convenience of hanging your pots and pans from the ceiling for easy access. They also help in keeping your kitchen organized. Pot racks lend an open, spacious air to the kitchen and move both clockwise and counterclockwise. This feature facilitates finding just the right pot or pan without spending time digging through drawers full of utensils. Use the above kitchen furniture ideas and accessorize your kitchen to transform it into a luxurious haven. Along with taking inspiration from our clever and functional tips, you may also add a bit of your personal touch to display your style quotient.